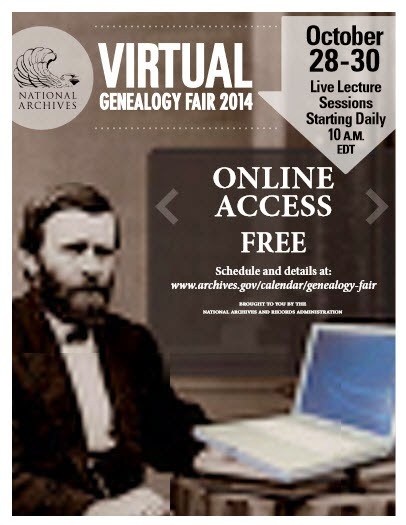 The National Archives is going to host it's second Virtual Genealogy Fair on October 28 - 30, 2014. These presentations are designed to teach genealogists about federal records and their use in genealogy research. The presentations will be given by National Archives experts from around the country and from the U.S. Citizen and Immigration Service. The live broadcasts begin at 10:00am Eastern time each day and will be available for free on the internet. The live broadcast format will allow participants to ask questions at the end of each presentation. Click here to see the schedule. I hadn't heard about this. Thanks for sharing!